History books will likely look back on September 2016 as a major milestone for the world’s climate. 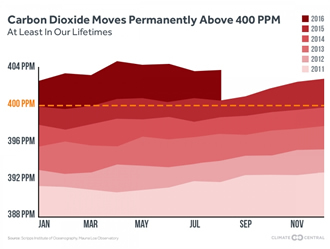 At a time when atmospheric carbon dioxide is usually at its minimum, the monthly value failed to drop below 400 parts per million. That all but ensures that 2016 will be the year that carbon dioxide officially passed the symbolic 400ppm mark, never to return below it in our lifetimes, according to scientists. September is usually the month when carbon dioxide is at its lowest after a summer of plants growing and sucking it up in the northern hemisphere. As fall wears on, those plants lose their leaves, which in turn decompose, releasing the stored carbon dioxide back into the atmosphere. At Mauna Loa Observatory, the world’s marquee site for monitoring carbon dioxide, there are signs that the process has begun but levels have remained above 400ppm. We may get a day or two reprieve in the next month, similar to August when Tropical Storm Madeline blew by Hawaii and knocked carbon dioxide below 400ppm for a day. But otherwise, we’re living in a 400ppm world. Even if the world stopped emitting carbon dioxide tomorrow, what has already put in the atmosphere will linger for many decades to come. The carbon dioxide we’ve already committed to the atmosphere has warmed the world about 1.8°F since the start of the industrial revolution. This year, in addition to marking the start of our new 400ppm world, is also set to be the hottest year on record. The planet has edged right up against the 1.5°C (2.7°F) warming threshold, a key metric in last year’s Paris climate agreement. Even though there are some hopeful signs that world leaders will take actions to reduce emissions, those actions will have to happen on an accelerating timetable in order to avoid 2°C (3.6°F) of warming. That’s the level outlined by policymakers as a safe threshold for climate change. And even if the world limits warming to that benchmark, it will still likely spell doom for low-lying small island states and have serious repercussions around the world, from more extreme heat waves to droughts, coastal flooding and the extinction of many coral reefs. It’s against this backdrop that the measurements on top of Mauna Loa take on added importance. They’re a reminder that with each passing day, we’re moving further from the climate humans have known and thrived in and closer to a more unstable future.